It’s the morning after the opening of the pop up show at Nice’s Théâtre de la Photographie et de l’Image. Over the past three to four days I have been photographing the beach, the promenaders and anything that caught my eye along the seven km stretch of the iconic Promenade des Anglais. During this project, my team from London were processing files, making prints and hanging the show, all in front of a stream of visitors who could watch the whole process. Twice a day I would return to base, download the recently shot images and – after an edit – pass on the next batch of images to be printed. The show was constantly changing. New photos were added and some taken down. The final version of the show was ready 60 minutes before the opening. Many of the visitors to the show yesterday had come to see the photos of themselves on display and we invited them to take away a small print of their own image. We also had the smaller prints of wider edits on the tables so these could be viewed as well. I have never attended an opening with so many people squeezed in and with such an enthusiastic crowd. Nice is a very cosmopolitan city and I wanted to illustrate this heady mix in the show. The Russians have their own section of beach. The local Nicoise folk also have their own stretch, where – particularly in the morning – they congregate for an early dip before the crowds descend. 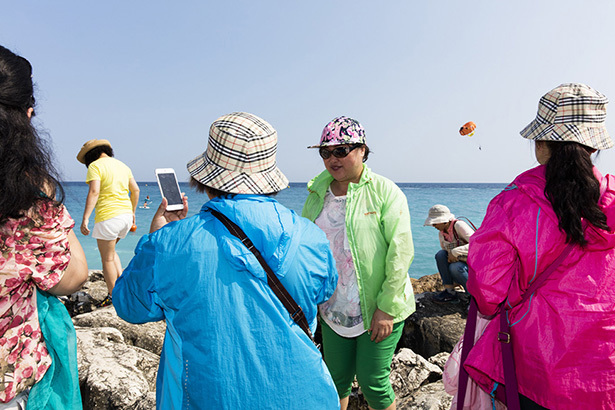 The Japanese are noticeable for their umbrellas and sunhats, and then there is an ever increasing number of the Chinese tourists: a new and very welcome addition to the tourist population. There is a full complement of Northern Europeans, Scandinavians, Germans and of course the English, who love to come for the guaranteed sunshine and to escape their own unreliable summers. Most of all, the locals frequent the actual promenade – early morning joggers, late night dog walkers, sunbathers and swimmers off to find their respective beach section. I stopped many of the strollers and did their portrait, and invited them to the opening. Life on Nice’s stony beach doesn’t just stop when the sun goes down. In the evening, especially after darkness falls, it seems almost busier than during the day. Many groups, predominantly young people, gather to drink, eat, listen to music and swim in the warm sea. Come the small hours, these groups start to thin out, but then it is the turn of the High Club – just past the magnificent Le Negresco Hotel – to be packed out. Every morning, by 7am, the army of beach cleaners from the City are in full swing as they pick up the debris from the night before (mainly bottles). These workers appear in force and have to navigate their way round the many sleeping people who have curled up in a sleeping bag or just expired with too much drink. By 7am, the very early dippers are also starting to show. Groups, mainly of older people, meet regularly: same time, same place, day in, day out. Les Promenade des Anglais now has a UNESCO-backed preservation order, but ultimately it is the people that make up this complex and inter connected community. My attempt to unravel this was hugely enjoyable, and the pop up exhibition was a great way to share my findings.